Minimum weight 15kg, pregnant women are not allowed. Experience Dubai from the water on a boat that can reach speeds of 30 knots. 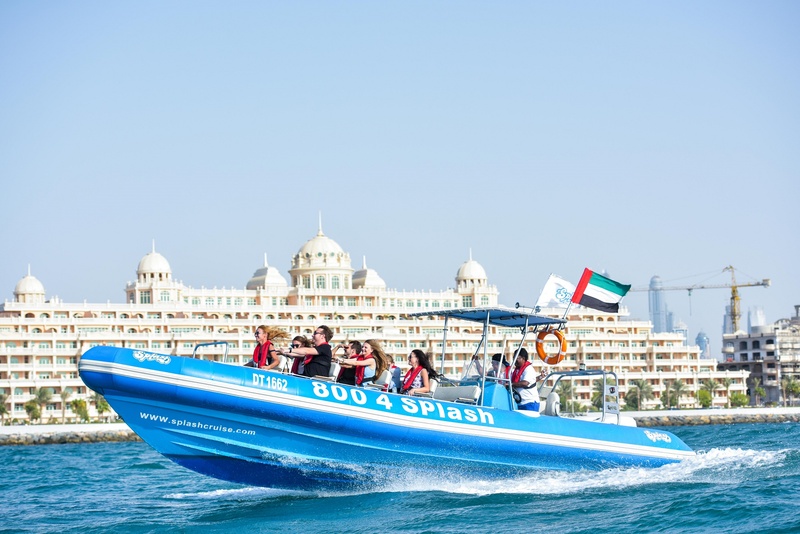 With Splash Tours, cruise into open sea where you will be able to see the Palm Jumeirah. The cruise will then head towards the iconic and famous Atlantis hotel, where the boat will pause for a photo opportunity from the Indian Ocean. The cruise will then visit other well-known landmarks such as the Burj Al Arab and then passing all the royal palaces on the way back to Dubai Marina. 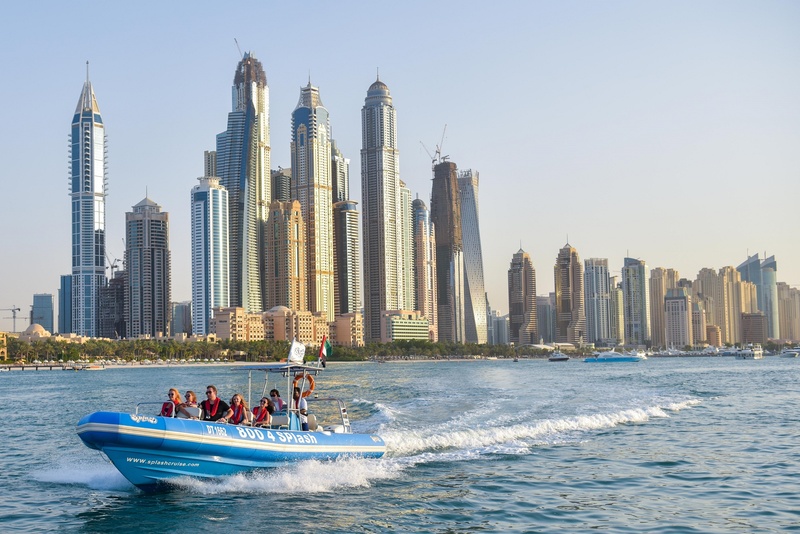 This tour ensures a very entertaining and thrilling 90-minute tour of Dubai from the water. Splash Tours takes you on a ride of your lifetime across the wide-open ocean waters. Hold on to your hat as you cruise past Dubai's top sights at great speed with your travel companions. Hitting a pace of up to 30 knots (34 mph/55 kmh), tours take you past iconic attractions, such as The Palm Jumeirah, Burj Al Arab, and Atlantis Hotel, and magnificent royal palaces. As the driver kills the pace of the jets, you’ll be able to take a moment to capture a photograph against the backdrop of these local monuments and places of interest! Share a joke or two with the crowd as your boat drifts back to dry land. In order to enjoy the Splash Tour, there is a minimum weight requirement of 15 kg. For safety reasons, if you are pregnant, you will not be able to board. Sunglasses are not allowed overhead. Be sure to be careful with personal belongings as it is a high-speed boat tour. Be sure to bring your own camera to take the unique views of Dubai from the water! 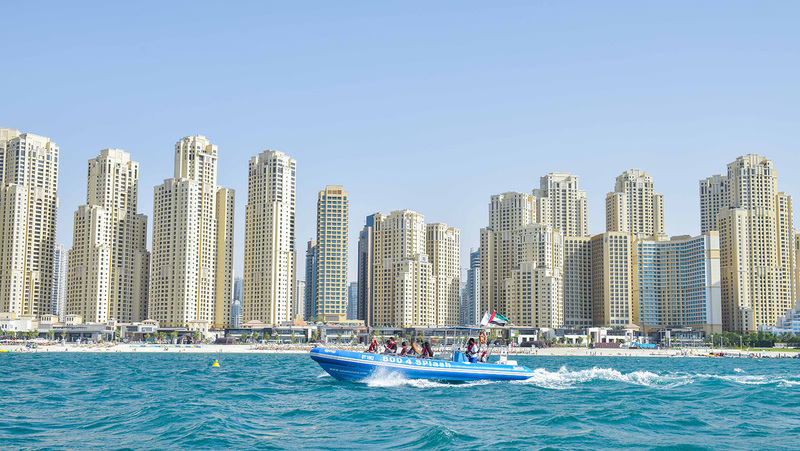 The Splash Tours departure location is the Dubai Marina. 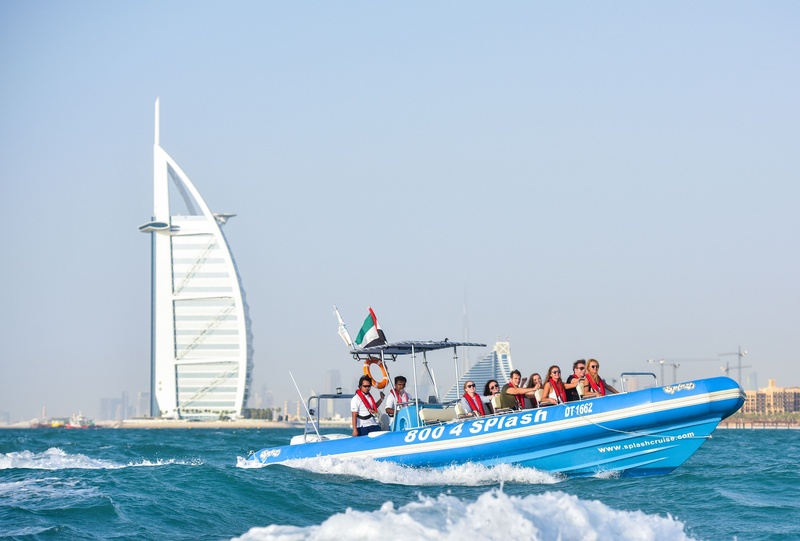 From Downtown Dubai, the Splash Tours can be reached in 30 minutes by driving a car or taking a taxi ride. If public transportation is your preferred method, it will take about 1-hour ride to reach Dubai Marina.